It took a long day of traveling to get from Kinosaki, on the Japan Sea, to Hattoji, in the mountains of Okayama prefecture. Along the way I took the train through Wadayama, a tiny town in the central mountains. It was surprising to me how much these towns reminded me of tiny logging towns in the Pacific Northwest. The train system in this part of Japan was the central form of transportation; but the population is so small that it's still very thin. This was a beautiful old brick enginehouse alongside the station in Wadayama. Several small train lines converged in Wadayama. 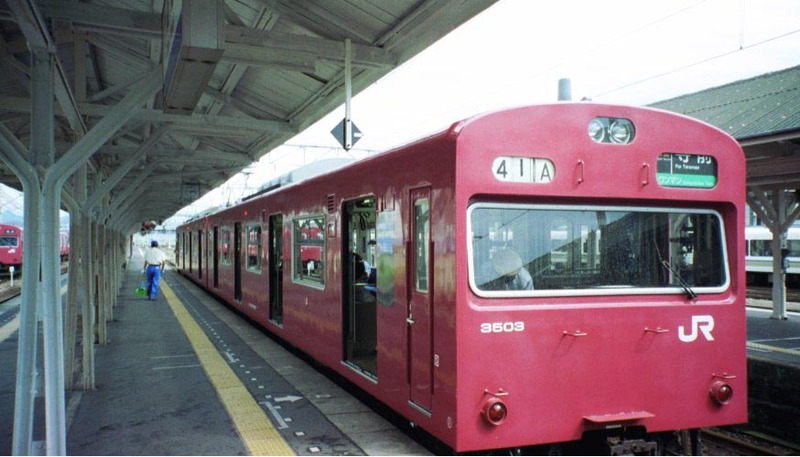 The trains in this part of Japan were these tiny two-car conveyances. Various signs proclaimed this kind of train to be either a 'bantan' (I don't know the derivation of that), or a 'wanman' in katakana. That's a Japanization of "One Man", referrring to the fact that there's no conductor, and you just drop your fare in a fare box, like on a bus. At right, a sketch of a wanman making a busy-for-a-wanman station stop.